Today as I was crossing some railroad tracks in Edina I noticed some yellow sweet clover blooming. A fellow beekeeper also saw some yellow sweet clover blooming coming in from Ramsey. I was on the ramp going home 0n 100 and 494 and saw alfalfa starting to bloom in the ditch. How is this possible with the time of the season? They are about two weeks early. It all comes down to growing degree days (GDD). As my previous post about the Black Locust. The link to the Black Locust page refers that it needs 140 GDD to flower. All plants use this same GDD to get to the point of flowering. While they are all different as to when they flower, the formula is the same. Alfalfa, clovers, Basswood, etc; all of these have predetermined by nature of when they flower. Of course moisture may play into this, the warm weather we have been experiencing has plants reaching their GDD early. Jerry Linser first brought this concept up to the MN Hobby Beekeepers on how beekeepers can determine with some accuracy when a plant will flower. This helps us to determine what plant is blooming and when to super. http://en.wikipedia.org/wiki/Growing_degree_day This is some interesting data. Capped swarm cells usually the bees have swarmed. This hive is more than likely cooking up a swarm. This warm humid weather is a swarm generator. Any crowded over wintered colony will very likely be cooking up some swarm cells. Regular 7 - 10 day inspections should be in place to stop the bees from swarming. Squash any swarm cells that have not been capped yet. 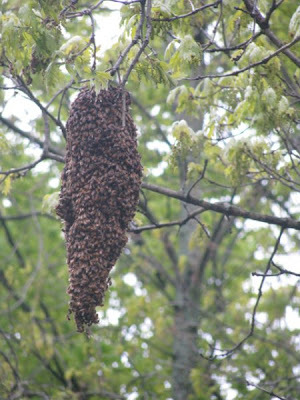 Capped swarm cells usually means the bees have swarmed. Make sure you can get a queen before the capped cells are squashed. It is normal to see the bees hanging outside the hive on a hot day. Strong colonies should have there entrance reducer out and the drawer out of any screen bottom boards. 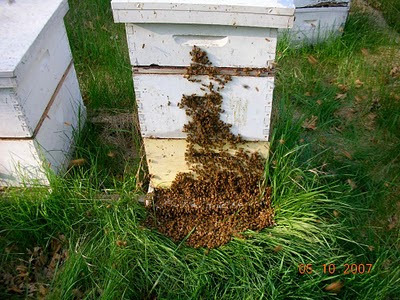 Grass in front of the hive needs to be cut short to keep the ventilation of the hive open for fanning by the bees. A rubber welcome mat in front of the colony helps keep the grass down. A lighter color is preferable to black. I have been talking with beekeepers. Several have told me that they were from the April 10th load. Many are almost done with their second box. The April 22nd load are putting on their second box. Some first loaders are supering two deep colonies and starting to get a little nectar. There is a good nectar flow going on in some areas Black Locust are starting to bloom. My friend who brings 200 colonies back from Texas put supers on his colonies on Wed and went through them today checking on his queens for the first time since coming back from Texas two weeks ago. In four days the bees had put up 20 - 30 lbs of Black Locust honey. I have heard of high expectations of the Yellow Sweet Clover bloom in South Dakota due to ample moisture last fall and this spring. 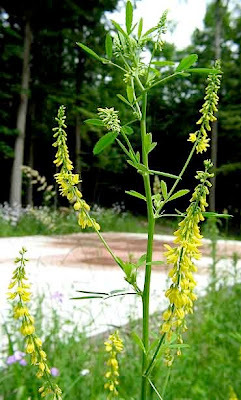 Yellow Sweet clover produces more honey in the Dakotas due to their general drier conditions. This seems to get the nectar flowing more there than in MN. If you never have tried true Yellow Sweet clover honey from the Dakota's, I recommend putting that on your bucket list. Carnage left in the wake of the hive predator called "the bear"
This is the new bear fence. 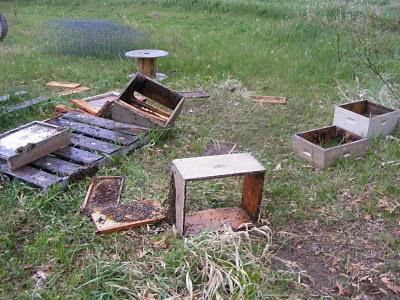 One of the beekeepers that had bear problems last week sent me some pictures of his colonies before and after the bear onslaught. He used livestock panels from Fleet Farm. They are 16 ft long and 52 inches tall. There were 6 panels used, his yard is 16 feet by 32 feet. These are the deluxe model with the bottom foot of fence, the wire is close together, and that will keep out any skunks. This type of fence is great because you can weed whip next to the wire and you won't wreck it with the weed whip. He also used a 12 volt solar fencer. I will say that this is probably one of the nicer bear fences I have seen. It will last a long time and should have virtually no maintenance other than the fencer battery. website on how to build a bear fence. 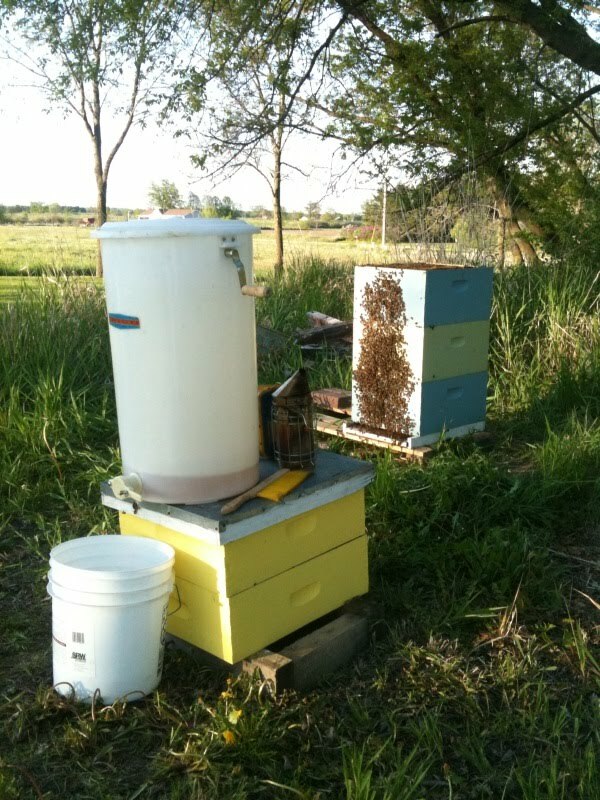 Extractor set up in the beeyard to extract out a honeybound hive. 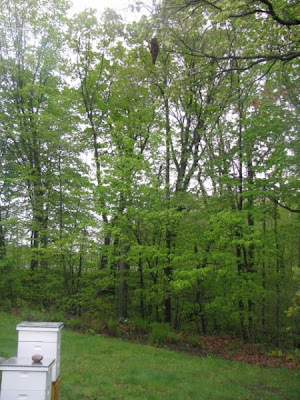 A beekeeper e-mailed me about not being able to split due to his hive was honey bound. Plugged with honey and no place for the queen to lay. This presents the problem that the hive will decline and the nectar flow will be a bust. The colony had a good population but not much brood. I suggested that he extract out the frames to give the queen a place to lay. As the photo suggests he brought his extractor out to his hive and made it happen. He now has a hive with great potential and maybe some honey for his troubles. A beekeeper sent me this photo. She was planning a divide and missed a swarm cell. She was disappointed because the divide was going to happen that day. A ladder would not have helped. This week with the warm weather swarming will kick into high gear. It is important to remove all entrance reducers from strong colonies. Also keep looking for swarm cells in the strong colonies. 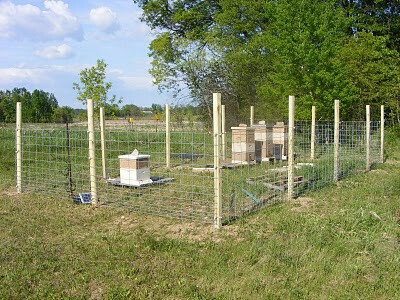 If the over wintered colonies have not been divided, now is the time to do it. Adding another box to a strong colony will not stop swarming. Yesterday I was checking my colonies and noticed a swarm had moved into some deeps I had sitting there. All of my hives there where packages, so I thank the beekeeper whose bees moved in for the new colony. Bears have been moving around leaving a path of destruction in their wake. I live in northern Washington County. This is now bear country as is Anoka County according to the MN DNR. 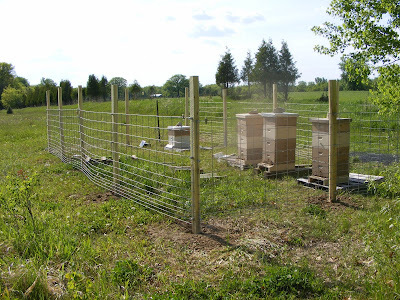 Most of my bee yards are electrified. It works and they will stop a bear. 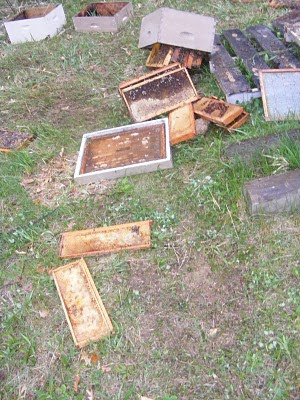 Two beekeepers living just north of me have been hit in the last week. They both put up an electric fence ATB (after the bear). One of them bought an electric fencer that is used on buffalo. Now that is my kind of beekeeper. If you live where there is bears, even an occasional bear, you will get hit at sometime. It will be at a time when the bees are at their best and will be an emotional let down. My suggestion is to put up a bear fence before the bears hit or you will pay for the fence and new equipment ATB. 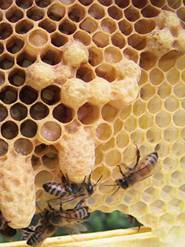 The cold weather of recent days has probably slowed the expansion of all bee colonies in general. The package bees that were installed on April 10th should be having emerging brood and the colonies populations will be expanding. With the increase in population the bees will be drawing out the foundation quicker. 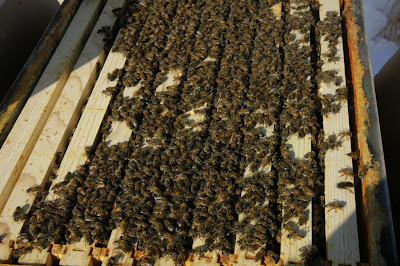 When the bees have drawn out 8 of the 10 frames it will be time to add a second box. When adding a second box, take a frame that the bees are working on and move it from the bottom box to the second box. The bottom box will have 9 frames and the top box will have 10. Continue feeding syrup if foundation is still needing to be drawn out. If the bees were installed on drawn comb they may be ready for another box by this weekend. I put in 25 Carniolan packages so far this season. I checked them all for queen acceptance. I was 25 for 25. One was on the fence. I put them in a week ago last Sunday. I did not see any eggs when I checked. I looked again on Wed and she was laying up a storm. She was laying two eggs in many cells. This is normal when a queen starts laying. She should settle down by this Sunday and should be hitting all the cells on the frames. Queen may take 10 - 12 days to start laying. 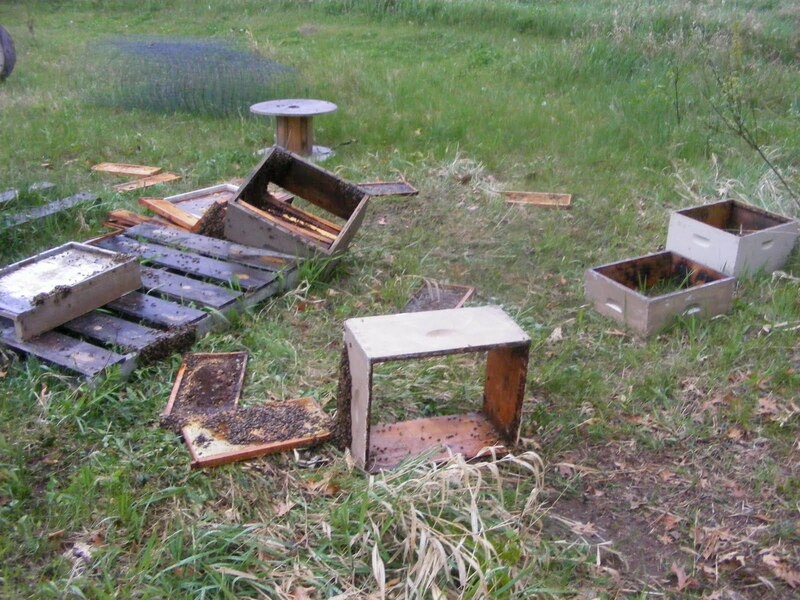 This happened to several beekeepers this year who were concerned they were queenless. Most of the queens started laying after two - three more days in the colony. Between the two loads of bees there was very little queen problems. Most being fly-aways. 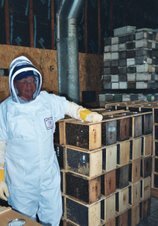 Out of 800 beekeepers maybe 20 had queen problems that needed a new queen due to the queen not being present after 12 days. I checked my package on Sunday. Everything was going great. The bees are building comb and the queen is laying. On my second package I have a queen that is not laying and I will check it again on Wed.